It remains to be seen if Nikkei has a sensible plan to leverage the FT brand, amidst the shifting sands of the global media industry. The $1.3 billion acquisition of the Financial Times by Japan's largest newspaper group Nikkei may have come as a bolt from the blue for many fans of the storied salmon pink paper published from London. Yet the word was out in media circles less than a year ago that Pearson Group would divest both its marquee global media brands, the FT and The Economist in 2015. And John Fallon, the Pearson CEO would be pleased as punch with the sale. Not only has he bagged an enormous valuation from his Japanese counterpart, but more importantly, he may have averted panic reactions in the newsroom by opting to sell it to a relatively conservative and benign owner, instead of an overbearing media baron from Europe or the US with the spectre of possible job cuts later, or an oligarch from Russia, Middle East or even India. The FT sale is significant for a variety of reasons. One, the global media business is in turmoil. And for the past few years the top brass at Pearson did pretty well to grapple with the threat of digital disruption. But inevitably, it had begun to soak up more and more leadership bandwidth, at the cost of its core education business. Finding a new home for the FT is, therefore, a pragmatic decision. Two, it may be tempting to read too much into Pearson's decision to choose an Asian acquirer over a strong German bid. Yet the fact is that there was far too much at stake for Nikkei, and that's why it would have agreed to pay 35 times its operating income. A European or an US acquirer, on the other hand, would have been hard-pressed to justify such a deal to its shareholders. For the past decade, Asian acquirers, from Japan, China and India, have poured money into developed markets at hefty valuations. Much of this trend is clearly visible for anyone who has closely followed this paper's coverage. However, since the turn of this decade, some of the landmark deals, like Tata's acquisition of Corus, have already unravelled and ended up eroding enormous shareholder value. Three, for any global media corporation, apart from growing mainland America, it is a given that the Asia-Pacific region will be the new theatre for action. It accounts for 60 per cent of the world's population. And both income and urbanisation levels are rising, as is the size of the working class population. Yet Western media corporations have had a poor track record of success in news media markets across Asia. Strong local incumbents continue to dominate the news media markets in China, India and Japan. And the highly regulated print markets have made the task of prising open the market even more difficult. India is no different. Market access has continued to elude the FT, despite several attempts in the past. FT ended its relationship with this very paper in 2008. Around the same time, it failed to stitch together a complicated, half-baked three-way alliance with Network18 and Business Standard. And its subsequent relationship with Network18 remained inconclusive. There was another big reason for Pearson to suffer from fatigue over its India strategy for the FT. 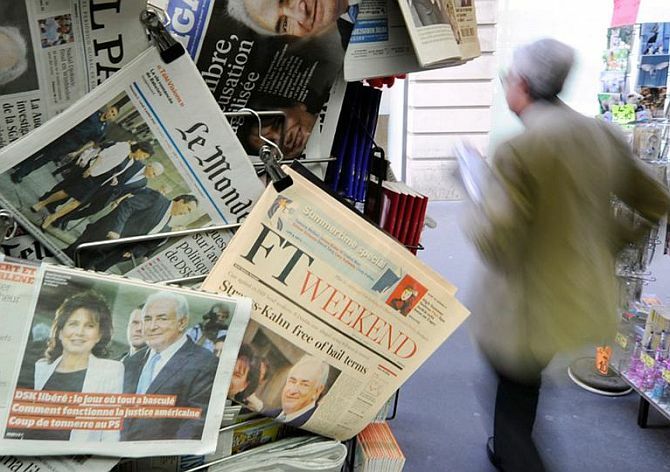 The FT management has repeatedly failed to secure rights over its brand in India. It may not be widely known that Pearson has waged a battle of attrition with the Times of India Group to wrest control of its intellectual property and trademarks over the FT brand that for the past two decades. The Times had launched a supplement titled The Financial Times - and much to FT's chagrin, claimed rights over the brand name in India. The case is still being fought in the Delhi High Court. And there's very little to suggest a speedy disposal is in the offing. Digital though, is a different matter, altogether. FT has architected a pretty sophisticated digital media model in the last few years and is seen as one of the few global media brands to have succeeded in building a large subscription business that's now bigger than its digital advertising revenues. Confidence levels are high. The word from inside One Southwark Bridge, FT's iconic HQ, is that their obsession with print is now a thing of the past. Nikkei, on the other hand, has a strong print presence. Whether digital forms the ballast for a new global expansion - and wins Nikkei's strong backing (or a new hybrid strategy takes shape) remains to be seen. However, after Daichi and DoCoMo's disastrous experience with their joint ventures in India, the mood inside Japan Inc remain sone of extreme caution. The Indian market is still a black box. And Japanese owners and executives simply don't have the confidence to navigate the corporate governance norms in India and its byzantine regulations on their own. In the meantime, Prime Minister Narendra Modi has gone out of his way to woo Japanese investors and shown a huge appetite for investments from the land of the rising Sun. Therefore, if Nikkei presses the right buttons in the administration and promises investments, it may be interesting to see whether the newspaper that has always believed in celebrating globalisation is able to finally secure its own passage to India.